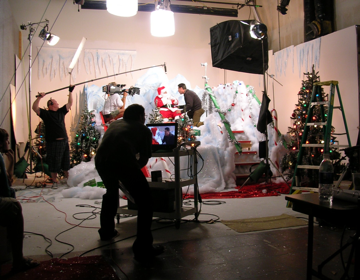 The client didn’t need a rendering, because they already knew what they wanted - a smaller version of the mall set from “A Christmas Story”. The red slide was something the director only needed to see a piece of, so I was able to build it like the original, except without the curve or length. Purchasing a plastic slide was almost $5,000, but this one I made for about $100 in materials. Everything else was rented staging and lots of Christmas decor. 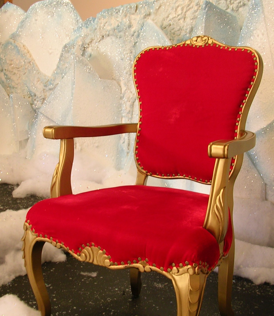 Santa chairs are really expensive, so I found a fancy chair on Craig’s List and re-covered it with red velvet and gold spray paint.